Is eBay the Future Home for Dead Neon Signs? Posted on August 6, 2009, 5:35 am, by Thomas Hawk, under Neon. This vintage neon sign can be yours… if the price is right! 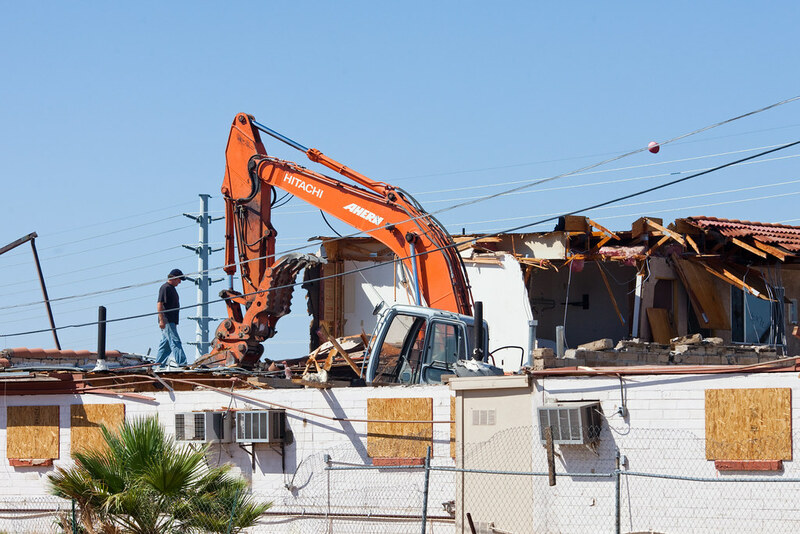 A few weeks ago I posted about my recent trip to Las Vegas and in my post mentioned that I took a few photos of demolition people tearing down the old Sky View Motel in Boulder City, NV. Some people wondered and asked about what would happen to the beautiful neon sign that sat on the corner outside the property. More and more classic American neon signs are being torn down either as businesses are being razed or simply torn down and replaced by ugly plastic alternatives. This movement towards tearing down beautiful old neon signs / uglifying America is part of what has me so interested in shooting as many of them as I can to preserve at least an image of the sign before they are gone. A lot of times these old signs simply are trashed. That’s what happened last year to the Walter Bennett Camera store in Oakland I understand. Museums like the MONA in Los Angeles, the Neon Museum in Las Vegas, the American Sign Museum in Cincinnati, and the Neon Museum of Philadelphia, have begun trying to save and preserve many of these vintage signs. While I was down visiting the MONA over Christmas I was talking to the guy working the museum there and he was telling me that more and more these vintage signs were becoming valuable items for collectors. He told me that the MONA had just sold their neon diver for thousands of dollars to a collector who had a bunch of large vintage neon signs around his swimming pool. (Now that’s something I’d like to see and shoot!). 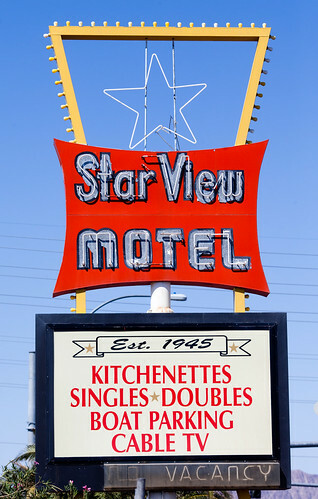 And like anything that collectors are interested in these days, I thought it was interesting when Flickr user call to preserve pointed out on my recent photo of the Star View Motel neon sign that it is now for sale on eBay. And it made me wonder if eBay is becoming the de facto home for old vintage neon signs, rather than simply scraping them. I suppose in some ways it’s good to see that some aren’t being totally destroyed. On the other hand, I sure do hate it when great art goes into the hands of greedy collectors who simply lock it up in their mansions, never allowing the rest of the world to see it. If you’re interested in the old Sky View Motel neon sign it can be yours for a song — $1,500 as a buy it now item to be exact. Of course you do have to figure out how you are going to get to Boulder City Nevada (right away as the ad reads) and cut the puppy down as well as transport a 8ft by 20ft neon sign to your backyard somewhere. I might suggest getting a friend really, really, really drunk and then egging them on to buy it. It could be hilarious watching them try to take the thing down. Hopefully if nobody buys this one for $1,500 it still ends up in a neon museum’s collection somehow. It’s too pretty a sign to let it go to waste. Recently when I visited the Neon Museum in Las Vegas they told me that a lot of these old signs are actually owned by sign companies and not by establishments themselves. That the sign companies simply lease them to property owners and then provide service as part of the deal. As often as Vegas neon turns over, sometimes this makes more sense for the casinos. In the case of this motel neon sign though, I suspect this one’s actually owned by the motel. It looks like it’s been there a long time. For one of the funniest stories I’ve seen about a guy who bought a neon sign check out this video here. Warning, there is a lot of swearing in the video but you should definitely consider watching it if you care at all about the preservation of American signs. You can see my complete collection of neon sign photos here. You can see my collection of motel neon signs here. You can see my photos from Los Angeles MONA museum here. 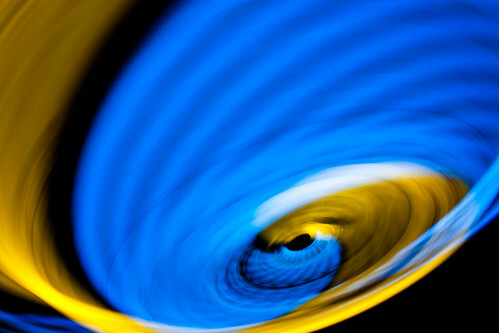 Posted on June 15, 2009, 12:45 pm, by Thomas Hawk, under Neon, Video. America Is F*cked……. (Graphically at least) from Jess Gibson on Vimeo. Warning: The above video contains graphic language. If you are offended by profanity you might want to skip it. My Motel America set was featured on Digg over the weekend. In the comments someone linked to this great video (above) about the death of a neon motel sign. The video is a short interview with Aaron Draplin talking about a 28 foot motel neon sign that he recently purchased on eBay while he was drunk for $300. In his rant he cringes at the crappy $15,000 ugly plastic sign that the new motel owners put up in it’s place. 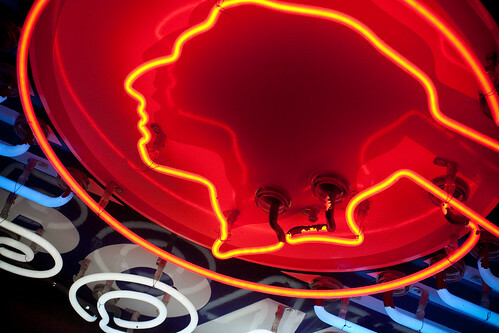 So much of American neon is disappearing every single day. Over the past few years I’ve literally watched dozens of signs disappear before my eyes. Personally I’m trying to photograph as much neon as I possibly can. My Neon Days and Neon Nights set currently has 2,656 images of neon in it. I’ve been trying to get out on the road as much as I can and travel to as many new American cities as I can to try and photograph as much neon as possible. When I was in Chicago earlier this month I shot a ton of the neon in and around Chicago. I shot this one motel sign on a vacant lot. The entire motel had been razed and the only thing left standing was simply it’s old sign. The highlight of my trip was stopping by The Neon Shop, AKA Fishtail Neon, and spending time there with it’s owner Tom Brickler. Tom had some great signs in his store and invited me in to the back room of his shop as well and showed me some fantastic old signs that he had there. It was really a treat. I’ve created a collection of my neon images as well that tries to break down neon signs by geographical areas. I’ve still got so much work to do in adding more neon images to my library, and unfortunately every day it seems like more and more signs are snuffed out of existence. Earlier today I joked when I wrote about Hunch that the first question I wanted to ask Hunch was what City should I visit next to shoot neon signs in America? Tom Spaulding, a prolific neon photographer himself said Wildwood, NJ. What do you think? Where’s the next City I should visit in America to shoot neon? Posted on January 26, 2009, 4:32 am, by Thomas Hawk, under Neon. Last month while I was down in Los Angeles I had an opportunity to stop by the Museum of Neon Art, or the MONA as those familiar with the museum call it. Those of you who follow my photography know that my Neon Days and Neon Nights set is one of my most worked on collection of images. I’ve got almost 2,000 photographs of neon in my collection so far and so I was very excited to be able to visit this interesting museum devoted to neon signs in Los Angeles. The MONA is easy to miss. It’s on 4th Street in Downtown L.A in a fairly nondescript space with three big letters in it’s storefront window, A-R-T. 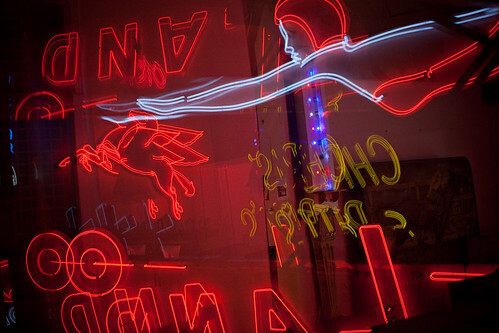 But if like me you admire neon, you will definitely want to stop by and check it out. The museum was founded in 1991 and the space it’s in now is its temporary space from what I understand. I don’t think that a permanent space has been identified for the museum but I think that they are working on finding one. The current space that houses the MONA is a little on the small side for a museum, but they make up for their smaller size by having some of the most amazing vintage neon signs I’ve ever seen. Included in their collection are a giant Jantzen neon diver, a great vintage Pep Boys sign, a Van de Kamp’s bakery sign, a Fun Land side with moving neon, and lots of other great vintage signs. In addition to the museum’s vintage neon signs, most of which were restored and in perfect working order, there were a number of other interesting group exhibits by contemporary artists focusing on neon. 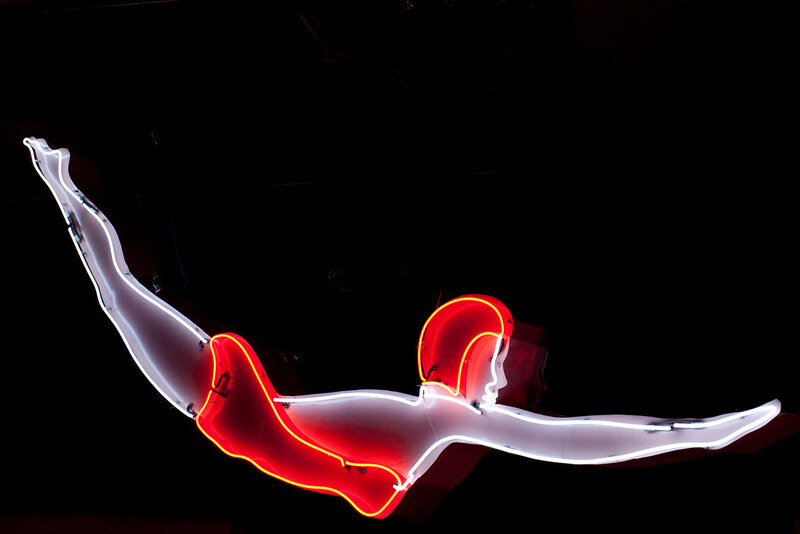 In the lobby of the museum they also had several fantastic neon photographs by photographer Rob Carter. They also had some great historical neon photographs, including a photograph of the first neon sign in the United States, a Packard sign that people used to drive from miles around to come see and visit. I spent a half an hour or so talking to the guy who was working the door at the museum and he gave me a lot of great background on the museum. Apparently, in addition to the museum itself they also have a giant warehouse with even more signs downtown somewhere that is not open to the public. Apparently the warehouse doesn’t have electricity so you have to visit it with flashlights. Hopefully someday I’ll be able to check out that place as well. My favorite thing about the museum? It was such a relaxing place to take photographs of their signs. It’s refreshing to me that the museum is so open with it’s photo policy and had no problem with me spending a few hours shooting their collection. I pretty much had the entire place to myself and had all the room I needed to work and photograph the amazing collection. I was able to get down on the floor to shoot and really had the run of the place. My only warning from the guy working there was to watch out for the suitcase that moves around on the floor, it’s an exhibit and sometimes people forget that it’s there. In addition to the neon museum itself, the MONA also runs a number of different double decker bus neon tours. I didn’t get a chance to go on any of those but I’ve heard from other people who have that they are great. It seems like every other day another neon sign is coming down. I worry that, especially with the bad economy, more and more places are going to go out of business and that we are likely to lose more and more historic signs going forward. Having a museum devoted to salvaging these signs and restoring them is a great thing. Hats off to the people behind this museum for doing the important work that they do. Admission to the MONA is $7. There is metered street parking, but bring lots of coins because the parking meters downtown are pretty expensive (fortunately I found a broken meter when I visited). The museum is open Thursday-Saturday noon-7PM; Sunday noon-5PM. I put together a set of about 15 images from the museum that you can view here. I’ve got lots more images of the museum that I still need to upload that I’ll be adding in the days ahead. Update: Interestingly enough there is an article today over at the Environmental Capital blog at the Wall Street Journal that talks about the recent decision by ConnocoPhillips to try and save some of the Union 76 service station balls that have been coming down. It looks like the MONA has in fact recieved on of these iconic balls from ConnocoPhillips. Thanks, Russell!